I always have clients tell me how they have failed yet another no or low carbohydrate diet. Then they stare at me like I am crazy when I explain to them how eating the proper carbohydrates at the right times will help them lose weight. Carbohydrates are a key macronutrient and essential for your body to function properly. Some healthy carbohydrates include whole grains, legumes (beans), fruits and vegetables. These carbohydrates contain fiber, which slows down the digestive process and keeps you fuller for longer amounts of time. If you are a huge pasta fan, do not deprive yourself of pasta, have healthy whole-wheat pasta instead of the refined and processed kind. 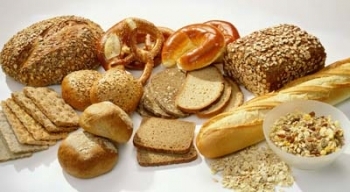 The reason why white breads and starchy processed carbohydrates are not good your body is because they are virtually stripped of all nutrients and packed with chemicals that interfere with hunger hormones. Refined and processed carbohydrates increase your levels of ghrelin, a hormone that stimulates your appetite and makes you crave more fake, highly processed foods. When you eat white ‘restaurant bread’ on an empty stomach, it enters your blood stream and instantly spikes your blood sugar, making you crave more of the same empty foods. This tends to lead people to overeat and then feel hungrier with no energy an hour or so later. I help my clients learn to make the right choices in the real world so they feel fueled, satisfied and energized throughout the day. We need carbohydrates to be healthy and thrive…just the right ones! Remember to focus on progress, not perfection and have compassion for yourself.